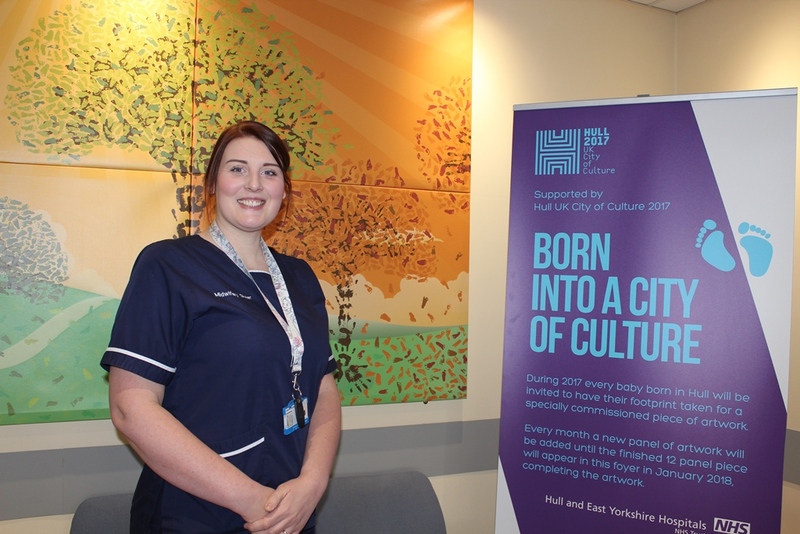 The latest panel of the Born into a City of Culture artwork project was installed at Hull Women and Children’s Hospital earlier today. The October panel, with its autumnal oranges, reds and browns, is the tenth of 12 panels to be mounted in the hospital’s entrance. The project involves taking the footprint of every baby born in Hull in 2017 and using these images to create a unique piece of artwork depicting trees throughout the seasons. The babies’ footprints represent leaves, while midwives hand prints also feature as the ‘supporting’ tree trunks. Every month, a new panel is installed and the October panel features 396 sets of tiny toes from babies born in either the Fatima Allam Birth Centre, the labour ward, or at home during the month. To date, there are more than 4,000 babies represented across the piece, which will be complete by January 2018. The Born into a City of Culture project is supported by the Hull 2017 Creative Communities programme and has been made possible with the support of local design and marketing company, Jenko. Postcards featuring images of the baby footprint panels are available for sale within the Women and Children’s Hospital or via the community midwifery office, priced £1 each. Each postcard represents two months i.e. January and February; March and April; May and June; July and August; and the latest postcard features the footprints of babies born during September and October. The whole set will be complete in 6 postcards.